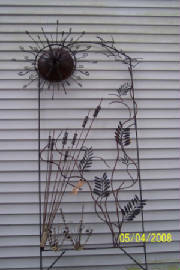 Garden trellis and arbors are all one-of-a-kind creations. 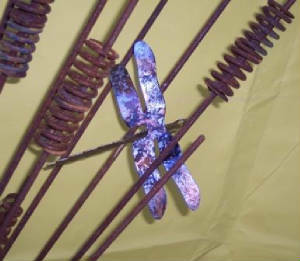 They are all steel and all re-cycled materials. The outer frame is typically 3' to 4' wide. The overall height is typically 4' to 6'. They are not painted and they are allowed to rust which gives them a dark brown patina and most importantly no maintenance required. They are a unique addition to any garden. Arbors stand on the ground. They disassemble into 3 large peices so they easy to transport - no tools required to assemble. 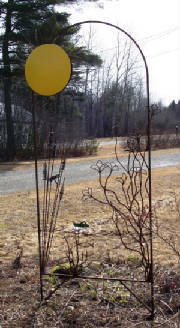 The trellis are one peice and is free standing with 1 to 1 1/2' going into the ground to hold them upright. 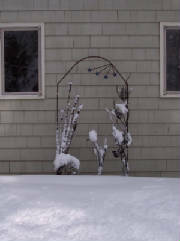 Arbors can be the unique entrance to your garden. This one is almost 4' wide and 7' tall. 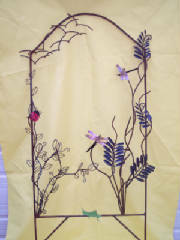 This handmade trellis is 7' tall.and looks great year round. They even look great in the snow! 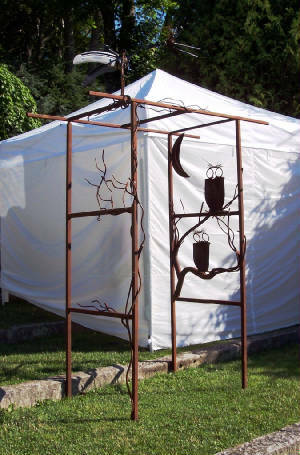 Each of these one-of-a-kind trellis sell for $300 to $400 depending on size and complexity. Arbors sell for $550 to $650. Fortunately, they can be shipped (call for quote) and by design they ride nicely in most SUV's - been to Maine lately?